Valentine’s Day has come to be primarily associated with chocolates, flowers, teddy bears – all very sweet and fun – but very superficial expressions of love. But this holiday can remind us to bring our awareness to something really important – how we are expressing love to ourselves and to others and in the world at large. Long ago the eyes were called the windows to the soul. Our eyes are sensitive, emotional receptors. When you really want to get to know somebody you don’t look up their nose, you don’t look in their ears, you look in their eyes. The eyes are an energy pathway out of the body. A window into someone’s inner being. A way for us to connect. Yet we can go through an entire day and go to the store, go to work and go to a million different places, but maybe never, or maybe only once or twice, actually really look into another person’s eyes. Why is this? Have our lives, like this holiday become more and more superficial? Are we afraid to see? Are we afraid others will see us? As children we were naturally curious and we felt little shame. Kids tend to start off very open, usually very loving, and caring. Most of us also started out with clear eyesight. But along the way we develop patterns that keep us from seeing, and as a result keep us from connecting. If a child sees something unfamiliar or alarming, say for example a man in a wheelchair, the little kid’s initial, immediate, unfiltered response is to be curious, “What is that? Why is that person in the chair?” The child might even want to go up and touch the chair or something like that. And what is often the parent’s first response? “Don’t look at him”. In that pure child’s way there is a relationship between what we see, what we feel and what we do, but when we are in our process of socialization, we are taught to separate that out. We are taught to not look at certain things, we are taught to not look at people in a certain way, we are taught to be separate and, in the process of being taught to not see, we are taught to not feel, and to not act. There is a connection between eyesight and personality, between eyesight and our relationship to ourselves, to others, to the world. There is something we call a “myopic personality”, or “nearsighted personality”, which we will talk more about in another post. Certain traits of this personality that are exhibited by people who are nearsighted, are a contraction, a withdrawal from the outer world, a flight response without actually fleeing. If you are nearsighted, or even if you are not, try examining whether there are ways in which you have constricted your world. Do you really see the people you encounter as you go through life? Do you allow them to see you? Tests have been done to show that if a person or an animal’s visual landscape is reduced for a period of time, for example marines who have spent time in submarines, they become more nearsighted. But the reverse is also true. When we retract into ourselves, bring our awareness in closer, we can create the conditions for ourself that lead to nearsightedness. This often happens on an unconscious level, so it is worth bringing attention to. What are you unwilling to see? Are you shutting down parts of your awareness or parts of your consciousness as an avoidance tactic? And are there ways to face those areas of your life and engage? Is it possible that we are not seeing or connecting because we know if we did we would feel something and inevitably be compelled to act on what we feel? It is only when we have lost touch with our own ability to see and to connect that we lose touch with the power of the fullness of our feelings and our drive to action. Or are we too afraid to look into someone else’s eyes because we don’t want them to see us? When we are truly seen we are exposed. Yet showing your authentic self can lead to the most rewarding connections and deepest love. Can you bring more compassion to yourself? An intimate relationship can be difficult if we have been patterned to disconnect, to shut down our feelings, and to hide. Can you allow yourself to be seen? Take on the challenge this month to make your expression of love a deeper one. Either reach out to someone you have isolated yourself from, or express yourself to someone you spend every day with in a more authentic way. Maybe there is someone at the checkout at the grocery store or at the gas station you frequent that you have encountered before but never taken the time to look in there eyes and see them. You could stretch by expressing an act of self-love and forgiving yourself or offering yourself some words of kindness . Maybe chose a certain limitation you have, a short-coming, a part of yourself that you have judged or not fully accepted. And spend some time with this part of yourself. Tell it you acknowledge it as part of you. These simple gestures can be incredibly powerful if done with pure intention. At the Cambridge Institute for Better Vision our goal is to teach people how to release the negative patterns on the muscular level in the eyes, but also how to release the negative patterns on the emotional level, how nutrition affects the way you see, how your mind, your attitudes, your perception, your imagination, and your inner healing can be used to help you change and improve your eyesight. Healing our vision and clearing the negative patterns that keep us from seeing brings forward the opportunity for us to feel compassion, to heal our hearts, and to love more deeply. It also allows us the opportunity to act out of whatever those open eyes and open heart call us to act upon. Contains a unique and balanced blend of 33 essential nutrients that are known to promote both eye and body health. Step-by-step, holistic approach that you can practice in just 20 minutes a day. Formulated using top-quality ingredients and manufacturing processes. Developed practices to improve eyesight. 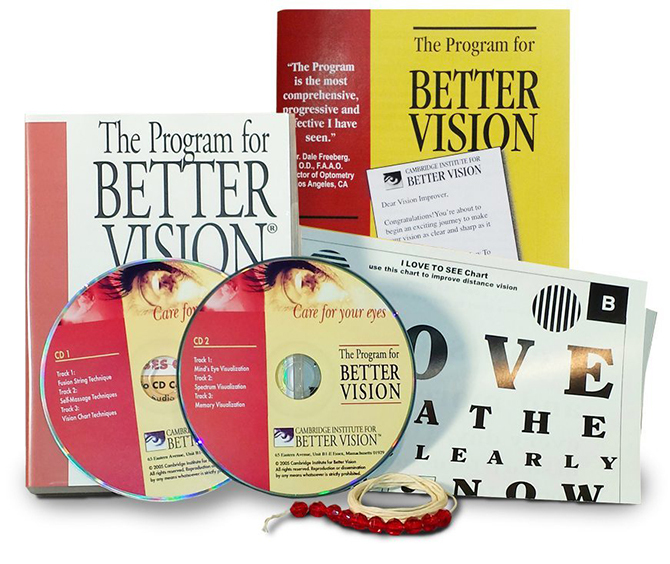 with the Program for Better Vision.